You sat by her during storytime. We’re not friends anymore. You smiled at her in the hallway. We’re not friends anymore. You’re playing flute instead of clarinet? We’re not friends anymore. One said when her granddaughter was young, she and a friend made a ‘we’re not eating tuna fish’ pact. One day the granddaughter brought a tuna fish sandwich to lunch and ate it, so her friend said their friendship was over. I’ve heard dozens of these stories over the years. Parents of kids in my youth group hoping church would be a safe place. Campers, offering their personal stories within the safety of the bunk beds. Young staff learning how to transition high school relationships to college. Articles in magazines. Moms in online parenting groups. This is a very real epidemic that we can dismiss this as ‘kids being kids’, or worse, as ‘girls being girls’. But is this how we want to define our girls? Do we want our little girls learning to threaten with their friendship? Get a text that you disagree with? Don’t respond. Ignore her. She parents her kids differently than you? Don’t set up another playtime. Pull away. Jealous of the promotion or opportunity she got? Don’t congratulate. Mutter to yourself how it should’ve been yours. She misspoke or made a mistake? Don’t tell her. Instead, tell another friend about your hurt feelings. There is power in friendship. If it didn’t matter, it wouldn’t be our kneejerk reaction to threaten ending it. We know what will sting, we know the intricate ways we can intentionally hurt another, and we know how to craft a phrase so it drips with veiled jabs. 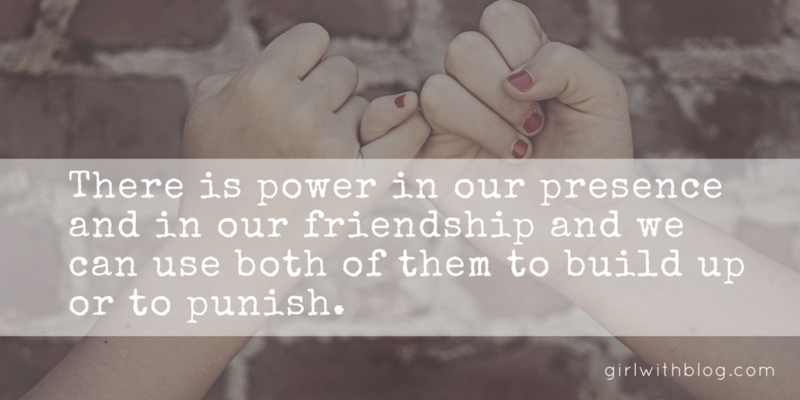 There is power in our presence and in our friendship and we can use both of them to build up or to punish. I’m tired. I’m tired of watching dramas unfold in green text bubbles. I’m tired of the unfriending, the unfollowing, the blocking. I’m tired of hurting for my daughter’s heart that’s not even been scarred yet. I’m tired of staying up into the wee hours of the night rephrasing words already spoken, replaying scenes already played, reminding myself of relationships lost. My heart is tired of seeing women hurt one another. Search ‘how to be a good friend’ and you’ll have thousands of options. Search ‘how to stop a bully’ and you’ll have just as many. We talk about a tribe, about a village, about being family. But the words are naught but clanging cymbals without love-based action. I don’t want to hear stories like the ones above from my daughter. Of course heartbreak happens. Of course you can’t be friends with everyone. But if I want her to know how to be a good friend, I need to be the one to show her. I need to treat my friends with respect, with kindness, with the benefit of the doubt. I need to rise above my old and deep-set habit of passive aggressive polite. I need to model friendship on purpose. It starts with us, moms. It starts with a deep breath. It starts with responding when you don’t want to. It starts with praying over our words before pressing ‘send’. It starts with simple honesty when it would be easier to stay silent. It starts with asking the hard questions and being willing to answer them ourselves. It starts in our kitchens, in our living rooms, on our phones and with our coffee pots. It starts in our own lives and it starts in our own hearts. I’m putting out a call to be brave. To embrace the sweetness and the depth of real friendship. To hold ourselves to a higher standard than silence. To become the kind of friend we pray our daughters have. This kind of friendship isn’t easy. It’s hard and messy and can come with real heartache. But it can come with richness and love and someone to really do life with, too, and it is so worth it. When I need to learn about friendship, I pick up Bread & Wine by Shauna Niequist (these videos say it all, as does all of her writing). Her stories of friendship make me want to dive in deep with my friends. And there are some truly amazing and inspiring pieces at (in)courage about friendship, too. Who – or what – inspires you to be the kind of friend you want your daughter to have? Yes! I want those friendships that build up for the sweet girlies in my life too. Your words are so true my friend! May we build up rather than tear down. Anna, this is…well, I don’t have a word for it. It’s good, it’s hard, it’s beautiful, it’s too darned convicting! 🙂 Fine, fine, I have several words for it. Thank you for YOUR words. I love your heart, Anna. Seeing so much of this with my girls trying to navigate school friendships right now. Parenting is intense! And I love the call to be a true friend, to model it. Love it.